When it comes to illustrations I have a mixed impression of the pictures appearing in the new WFRP products. Most often the colour pictures are good or very good, but the black and white illustrations often do nothing to invoke the Old World atmosphere and would fit more appropriately in a generic fantasy setting. In the Game Master’s Toolkit booklet there are several interior artists, and I’m glad to see that the new additions do a much better job at bringing across the WFRP atmosphere than earlier offerings. Two full page illustrations by one of the interior artists also grace the player side of the screen, and manage to invoke the same ambiance as did John Blanche and Ian Miller at the genesis era of the game. Looking at the screen and the interior illustrations in the same style, I am reminded of the cover to Death on the Reik and Warhammer City, as well as The Enemy Within/Shadows over Bögenhafen. The Game Master’s Toolkit is by no means perfect and shows some of the problems we have grown familiar with in products from Black Industries with regards to quality control; a few typos and editing mistakes although no mistake is as dire as the ones found in Tome of Corruption. Overall the quality is very good. The screen is physically the most solid I’ve ever seen and the information displayed on it is for the most part useful for any WFRP Game Master. The map is a welcome feature but it is the illustrations on the side facing the players, together with the similar style pictures in the booklet, that is the most refreshing surprise! The main problem with the screen is that two full columns out of twelve on the Game Master’s side is taken up by page references for skills and talents. It would be far more useful to list a compact summary of the effects and in my experience this would speed up play considerably. I still find the lists of some use, so the space isn’t completely wasted. The majority of the screen is filled with useful information, such as weapons, tables for critical hits and for generating names for NPCs at a pinch. The strength of the booklet lies in the support it gives to Game Masters who need ideas to build on for their own campaign. It is filled with tables from which a Game Master can choose or roll randomly for basic adventure seeds, campaign additions or NPCs. Reading the tables cover to cover can be a bit tedious, as everything is by necessity presented as snippets of information. The Game Master must be prepared to do additional work to flesh out the information given, but as the booklet is a veritable treasure trove of ideas it is a very useful tool for a game master in need of ideas. And for the map. WFRP fans have been clamoring for maps of the Old World since the release of the second edition and the map over The Empire on the screen is a good first step. There is a lack of details which make it less useful for the game master but at least it puts all the major cities on a clear and legible map for the players to reference when getting their bearings during travel. 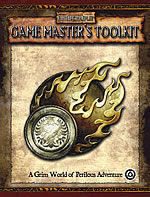 To sum up the Game Master’s Toolkit is one of the best additions to the WFRP line of products, and it is is useful both for planning your session and running it.